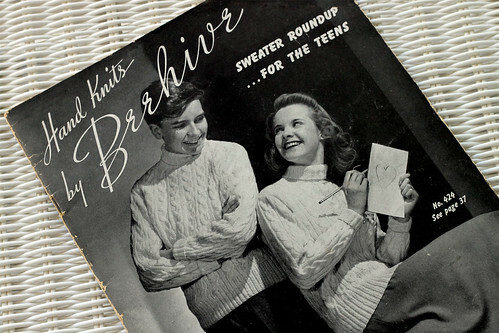 Here are a couple of pages from the 1942 Paton’s pattern book “Hand Knits by Beehive, Sweater Roundup…for the Teens”. Most of the patterns are basic knit silhouettes. I have been busy with a few little projects around the house. I hope you all do not mind some inspiration form the past. I liked the puffy sleeves and cable epaulettes on this sweater. 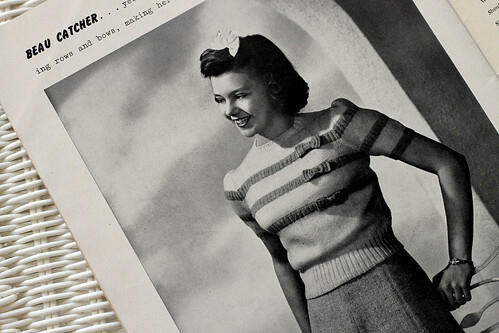 The ribbed stripes and bows are a nice addition to this sweater. This entry was posted on Wednesday, October 7th, 2009 at 3:00 am and is filed under Book and Knitting. Tagged: Book, Knitting. You can feed this entry. You can leave a response, or trackback from your own site. FINALLY a book that I have, so I don’t have to drool over the keyboard. 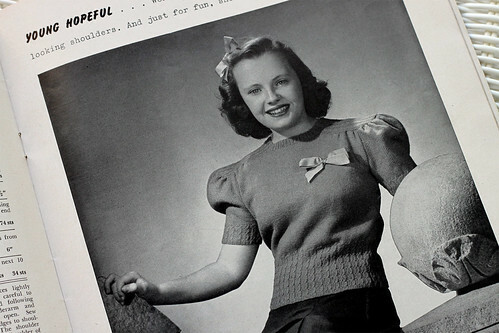 I LOVE vintage knits, –if I only had the waspish waist. A couple of years before I started to knit, I had to break up my Mom’s house. I hate to tell you how many old pattern books I put out on the curb! I try not to dwell on it–but, if only I knew then what I know now!